It’s hard to make a commitment to artwork. What if it doesn’t look the way you think it’s going to look on your wall? What if you get sick of it or decide to redecorate? TurningArt is the ideal service for those interested in sampling different artwork. You can try out artwork on your wall, live with it for a while, then decide to keep it or trade it for something new. TurningArt’s curated art collection is a bit like Netflix, but for wall art. By rotating artwork you can figure out what works in your home or office space. You can browse the work of emerging artists and create a queue of pieces you like. The first piece you receive comes with a frame and is ready to hang. As you swap pieces, the frame stays with you. All TurningArt prints are designed to fit the same frame, and it’s easy to remove the old print and replace it with a new one. When you find a piece you love -- a photo, watercolor, collage, oil painting, pastel, drawing or mixed media piece -- you can opt to purchase the original. The money you’ve spent on a TurningArt subscription earns you credits toward the purchase. Jason Gracilieri founded TurningArt after staring at empty walls for a long time. He had trouble finding artwork that he really loved, that had meaning for him, to fill those walls. So he set out to create a better way to discover and buy artwork. His company brings together “art-loving geeks and technology-loving artists,” and the combination is enabling artists to find a new home -- temporarily or permanently -- for their work, filling one blank wall at a time. Season’s Greetings Grommet fans! My name is Jason Gracilieri. The inspiration for TurningArt came several years ago when I was decorating my then-new apartment. I didn’t want mass-produced wall décor, but I was daunted by the prospect of buying original art. “There must be a better way…,” I thought. TurningArt has come a long way since then, and we find customers use the service for all sorts of reasons — some use it to shop for the perfect piece, others simply enjoy getting fresh art in their homes every now and then. The enthusiasm we see from our customers is really heartening; we've been especially struck by number of customers who are giving TurningArt as a gift this holiday season. We're thrilled to be featured as today's Grommet, and I look forward to hearing from all of you. Jason - how do you price the art? The only charge I see is an email subscription. What if I want to keep something for 2 months? And then I decide to return it? Hi Deborah - Thanks for your question. For $10/month, you get access to all of the artwork on TurningArt - and you can change it at whatever frequency you choose. That $10/month also earns credit towards purchasing any of the art on the site. Today's grommet is highlighting our gift subscriptions (delivered via email), which are bundled for 3, 6 or 12 month periods. I hope that helps! So, there must be a limit on the number of pieces one can have at a time. Is $10/month for 1 piece? Is there a subscription for more than 1? @Elizabeth Carr: For $10/month subscription, you can have unlimited print rotations of 16? × 20? frame. Includes free shipping too. Isn't this great? art!!! I picked my "3"! 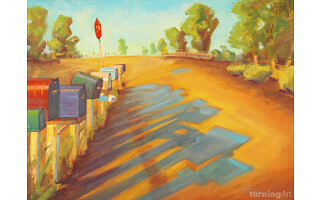 The picture of the brightly painted rural mailboxes caught my eye and I wondered if someone could tell me who the artist is? I saw a similar painting at an art center in Kirkland, WA a few years ago, walked away without it and have regretted it ever since. I would love to get more info! Thank you! It’s hard to make a commitment to artwork. What if it doesn’t look the way you think it’s going to look on your wall? What if you get sick of it or decide to redecorate? 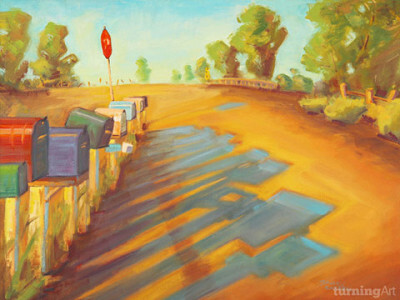 TurningArt is the ideal service for those interested in sampling different artwork. You can try out artwork on your wall, live with it for a while, then decide to keep it or trade it for something new. TurningArt’s curated art collection is a bit like Netflix, but for wall art. By rotating artwork you can figure out what works in your home or office space. You can browse the work of emerging artists and create a queue of pieces you like. The first piece you receive comes with a frame and is ready to hang. As you swap pieces, the frame stays with you. All TurningArt prints are designed to fit the same frame, and it’s easy to remove the old print and replace it with a new one. When you find a piece you love -- a photo, watercolor, collage, oil painting, pastel, drawing or mixed media piece -- you can opt to purchase the original. The money you’ve spent on a TurningArt subscription earns you credits toward the purchase.